The end of Hercules | Learn about Greek Mythology,Greek gods,Greek mythology stories! The moment Nessus was dying from the poisoned arrows of Hercules, told to Deianeira that her husband does not love her anymore, and that in order to win back his love, had to give him to wear a tunic, once she dive it into the blood of the dead centaur. Deianeira, who did not know that the blood of Nessus was poisoned by the arrows, she gave his robe to the hero. 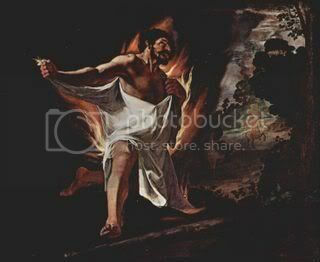 The pains of Hercules were so horrible,that he got so mad and set fire to himself on the top of Mount Iti and was burned alive. Even today, the highest peak of this mountain called Pyra. After his death, Hercules was deified,he became the God of power and bravery and leader of heroes. Zeus took him to Olympus were he married with the goddess of youth, Hebe. Hera accepted ​​him as her child. Ancient Greeks depicted Hercules, usually dressed in lion's skin, holding a bat in hand, with giant stature and body strong, youthful and robust.